Tired of waiting for your terrain to come out of the TRGen only to find it has a bunch of glitches you could tell from your height-map? Well, if you happen to have 3DMax that supports the "Displace" modifier, you can easily and quickly import your height-map onto a 1024m square plane and do any necessary adjustments. Export your height-map into a .TGA or .DDS. 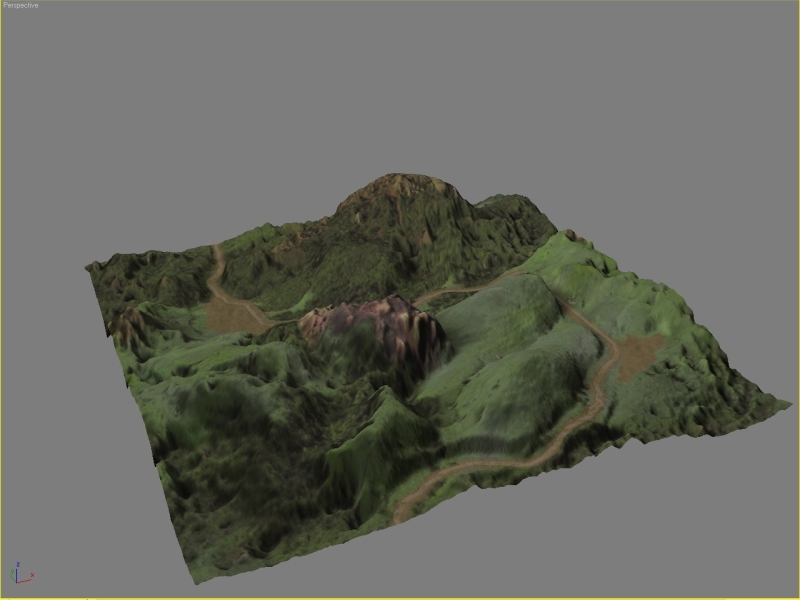 In the roll-outs, click on "Bitmap"
You now have a terrain mesh that you can manipulate in 3DMax for your enjoyment! The next part of this tutorial will take you through the steps in making minor fixes to the terrain, as well as tackle the process of making a new height-map from your edited terrain mesh. In the Render Elements Roll-out, click "Add..."
Select "Z-Depth" and click "OK"
In the Render Scene Dialog (with your Render Elements tab open) scroll all the way down and find the "Z Depth Element Parameters"
For your Z-min height, punch in "0 m"
For your Z-max height, punch in "128m"
Make sure that the "Displacement" checkbox is Filled. Last edited by ShadowZ on 02-17-2010 08:24 PM, edited 2 times in total. It was brought to my attention that somebody already figured this out... oh well! Strength Value and Max Z-Height Values found. Header Post has been edited to reflect new Info.